I had lunch with a friend of mine at a local Thai restaurant. On that day I decided to get the Thai Beef salad and it was so delicious I wanted to recreate that flavor profile at home on my BGE. I started to research the flavors of Thailand and in the process came across this recipe that I modified for the Big Green Egg. I am here to tell you how good these taste and how much of a hit they are every time I serve them. They need no additional dipping sauce as the sweet and spicy stickiness of the wings does the trick. Enjoy! Cooking the wings on a raised grid with direct heat gives me the best outcome. Served these bad boys up with some rice and an Asian cucumber salad. In a small bowl, add 2 cloves of the minced garlic and sprinkle with a pinch of salt. Massage the salt into the garlic to begin to extract its oils. Dilute with ¼ cup of water and allow to sit for 5 minutes. Strain the garlic mixture through cheesecloth into a clean bowl, squeezing to extract as much flavor as possible. In another bowl, prepare the marinade by whisking together the liquid garlic extract, fish sauce and superfine sugar. Add the chicken and the marinade to a reseal-able zip-top bag and place in the refrigerator overnight. 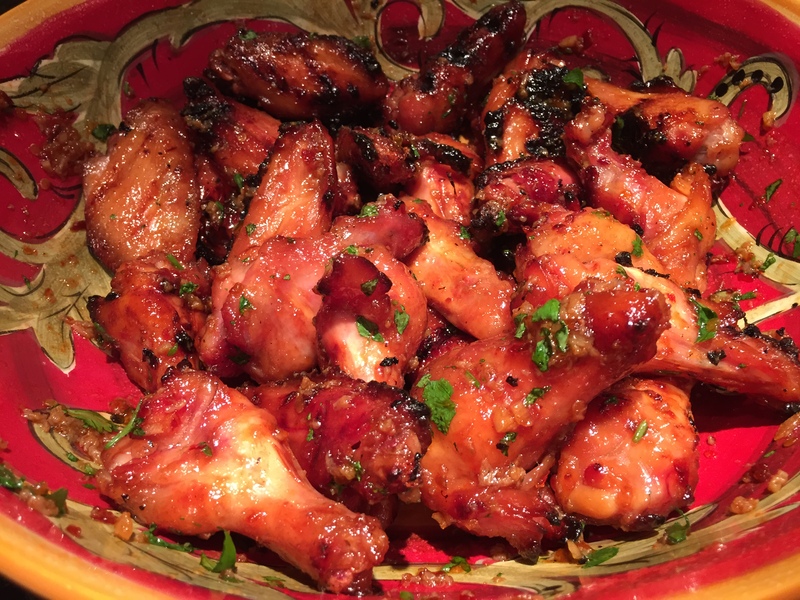 Make sure to toss the wings occasionally to evenly distribute the marinade. I added the garlic & ginger, too. Bring this to a slight boil over medium-high heat and then add Roasted Red Chili Paste.